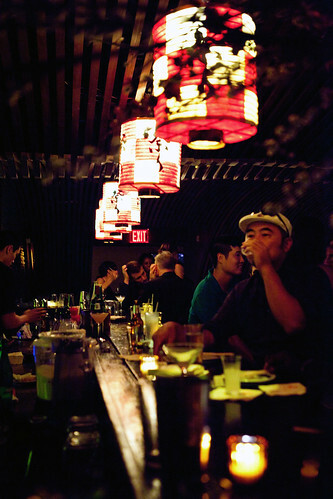 Matsuri is a Japanese restaurant located at The Maritime Hotel in Chelsea, under the helm of Chef Tadashi Ono. I do like Chef Ono’s style of traditional Japanese cooking, as I do cook out of his book The Japanese Grill, co-written with Harris Salat. 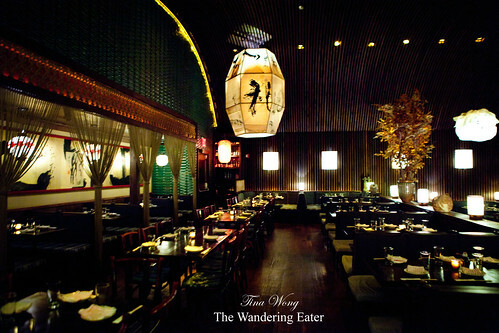 I was invited to a preview tasting dinner of the restaurant’s Seven Deadly Sins menu debuting in October. The first course Pride was easily the best course of the evening. 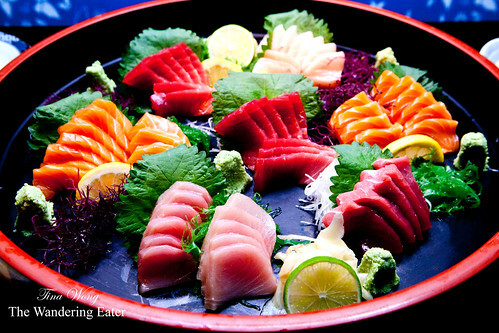 Silky, pristine slices of tuna, yellowfin, and salmon sashimi served with freshly grated wasabi (there’s an astronomical difference in flavor between the stuff from a tube or box than the actual root) and pickled ginger. 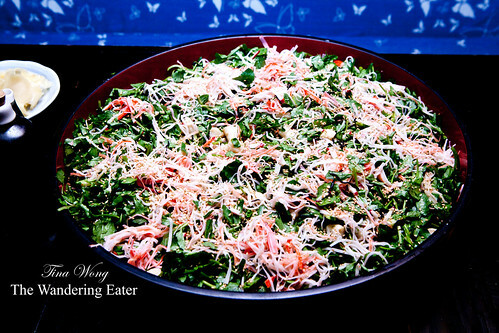 The Envy salad of watercress, hijiki, soy dressing was delightful to eat. Fresh, crisp, slightly bitter watercress, mixed with the slightly crunchy hijiki seaweed, nutty sesame seeds and shredded surimi created a very well rounded salad. I wouldn’t mind eating this salad everyday. Wrath‘s presentation was beautiful with vibrant colors of the grilled cherry tomatoes and shisito peppers. 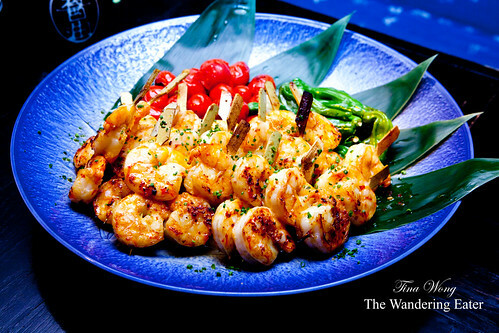 The large, grilled yuzu marinaded shrimp were fun to eat with the little skewers – and most importantly tasty. I wouldn’t call this dish “wrath” since it was pretty mild. 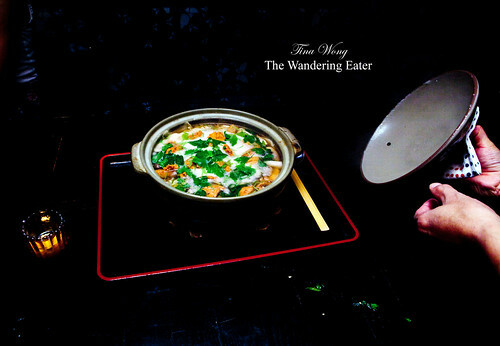 Lust on the menu was stated as an “aphrodisiac” hot pot made with uni (sea urchin), oyster and yamaimo (Japanese mountain yam). Presented in a large clay hot pot, it somewhat reminds me of my childhood but much more upscale with the use of sweet uni and oyster. 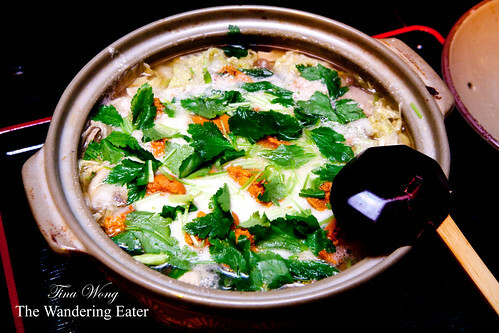 The broth cooking this hot pot was a velvety, rich seafood consommé. Gluttony was a duck-lover’s dream. 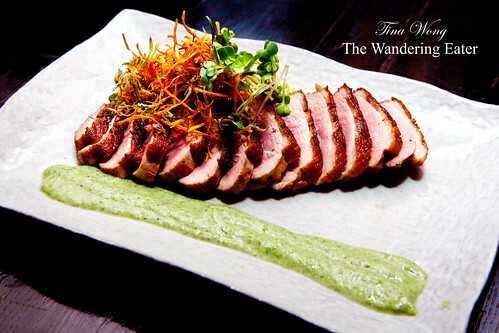 Tender slices of roasted duck breast, cooked to a perfect medium-rare. 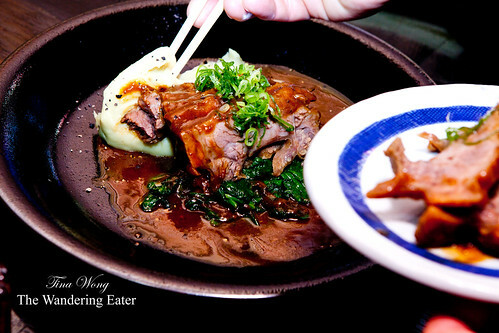 It’s served with a fresh wasabi sauce to cut some of the fattiness of the duck. 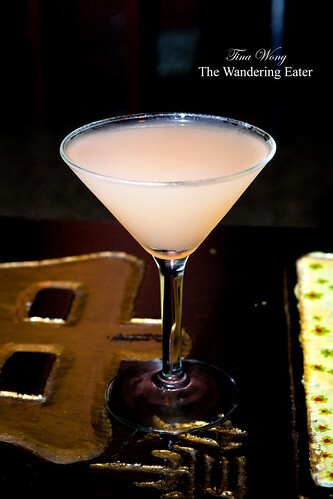 It’s simple and very delicious. Sloth is a pretty apt name for this dish, as it is braised short ribs in a miso broth on a pillowy bed of puréed sweet yamaimo. It’s a very hearty dish that can possibly make you feel sloth-like if you ate the entire family-sized portion; a few slices can go a long way here. 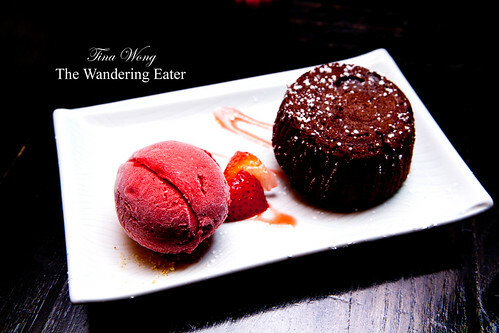 Greed is a pretty simple dessert that a lot of people are familiar with – an individually-sized warm chocolate cake with a molten center with a large scoop of tart raspberry sorbet. This dessert is a perfect ending for this meal. Rather than feeling “sinful” at the end of the meal, this menu felt more like upscale Japanese comfort food on a cool, fall evening to me. The food was executed well. The service was professional and friendly. Awesome captures, excellent nice pictures. Thank You for sharing! Bill Thank you for the compliments and dropping in to comment!